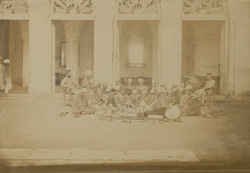 Photograph of an Arabic-Persian class at Canning College at Lucknow in Uttar Pradesh from the Archaeological Survey of India Collections: India Office Series (Volume 46), taken by an unknown photographer in 1871. Here the doorways behind the group have been opened to reveal the interior of the classroom beyond. Canning College, founded in 1864 and partly supported by the talukdars (local landowners) was the chief educational institution in Lucknow; an important educational centre in India. The founder named the college after his benefactor Lord Canning (Governor-General from 1856-1862) who rewarded him with a taluk (subdivision of a district) for his loyalty during the Indian Uprising of 1857. In 1922 it was incorporated into Lucknow University, together with two other colleges.